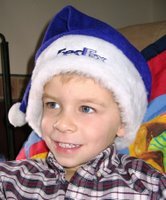 So, as part of Mike's time spent on Operation Evergreen (donation of Christmas trees and ornaments to troops in Iraq and Afghanistan), the crew at FedEx donated services to ship everything overseas. 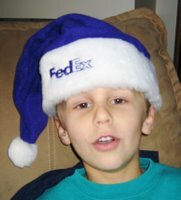 Somewhere along the line, Mike picked up this FedEx santa hat which the kids seemed to think was pretty cool. 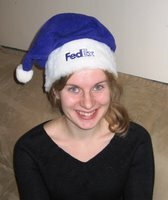 So, here are their mugshots - goofballs!